WELCOME TO BergiesPlace, MY PHOTO JOURNAL…. …of commentary and images of places, things, or events that I’ve photographed or remembered. On the right are posts from the past few months; click on one and you’ll be taken to it. ALL earlier posts can be found by clicking here for an alphabetical index.. if If you’d like to get an automatic email whenever I add a post, simply click under Email Subscription at the lower left. You can always unsubscribe. camera; it’s a setting in your head. If you enjoy my photography, get some insight into how I’ve done it over my 70 years of shooting. Here’s how I knew it was August. Our local “everything” store at the shore carries housewares to hardware to seasonal clothing. As the season opens they advertise 20% off on the clothing; with July it becomes 30%, and when I drove by on August 1st, sure enough it was 40%. So, got to get some summer scenes into a blog post. The official opening, the summer solstice, offered a grand view of the Black Pearl returning from her evening cruise. A good start. Although it was not officially summer at the time I enjoyed a Philadelphia street fair, the Philadelphia International Festival of the Arts. Such fairs are wonderful for me. I think it’s great to see so many people and families out enjoying the scenes and the activities. When else would you find a pool and a bubbling fountain in the middle of south Broad Street? Billy Penn remained sanguine above it all. Also above it all Yannick Nézet-Séguin, wind blown but unfazed outside of The Kimmel Center urged his players on to ever great glory. Makes me wish the season had already begun especially since my season tickets arrived last week, another sign of August. From Broad Street back to the shore. I photographed a couple of these at twilight. In better light one was seen to be a yellow crowned night heron and the other, a juvenile heron of some sort. I liked backing it up with the clouds, and the juxtaposition of the tree branches. I’ve lived seasonally on, over, or next to the bay (what the forecasters call the back bays) since I was about five. In the early years that would have been in boat houses on pilings in Ventnor, NJ. Later in life we enjoyed an Ocean City, NJ bay front condo for about twenty years. In those years a summer highlight was the Night In Venice boat parade. For most of its life the tradition was to decorate one’s boat with lights and anything else that fit the theme, and to add music or other entertainment. I can recall one yacht that featured both the Eagles’ Cheerleaders and the Union League Mens’ Chorus. Homeowners along the parade route would respond with their own elaborate decorations, and it was a happening. Then there was a terrible boating accident one night and it was determined that thenceforth the parade would be conducted in daylight. Safer, yes, but also the “light” was gone. Then we and others awaited darkness as fireworks had been promised. The fireworks barge can be seen anchored at left. Darkness did arrive and we were enchanted by the show. Yes, some of the “light” had returned. From a Night In Venice we segue to a day in Beach Haven. We’ve just celebrated the annual Downbay Regatta. This is a summer event at which sailboats from the upper Jersey coast gather for competitive partying and racing at the Little Egg Harbor Yacht club and its adjacent sailing waters. The classes include A-cats, B-cats, Lightnings, and E-scows. Saturday was a washout because of the scattered storms. They all sailed out but were recalled before even one race. Sunday made up for it as a glorious day. *Corrected: Walter did not graduate from Annapolis as this post originally stated. Rather, it was Princeton and he subsequently was commissioned into the U.S. Navy and served on the Annapolis faculty for the duration of W.W. II. I placed as a finalist in 2012 but haven’t entered since then. With thousands of entries it’s intimidating but this year I decided to try again and submitted six images . Looking at them later and trying to reason like a judge I guessed which one might make it and it did. Here it is. I love the image; I love the memory of the capture; and I’m immensely pleased. I was notified of my selection in late May. They’re still in the process of selecting first, second and third. I’m just happy to be a finalist. The image was made at a place called Skaget Beach (rhymes with say-get) on Cape Cod Bay west of the town of Orleans at the elbow of the Cape . A helpful proprietor of an art/print shop in Chatham had suggested the beach in response to my seeking a good sunset location. I spent an afternoon there capturing families at fun on the beach. On the next afternoon, however, the sky began to shape up for a smashing sunset. I took lots of frames of differing compositions but this scene prevailed. The techy stuff: I composed in live view with my (then) Canon 7D on a tripod and using a Canon 24-105mm EF lens at f/14. ISO was 400. I took three exposures around 1/40″ with EV’s of +1, 0, and -1. I developed them in Camera Raw in Photoshop CS6 and blended them with Nik’s HDR software. From the look of the originals I probably heightened saturation. I teach and preach that sunsets need to be more interesting; pretty pixels are not enough. The things I love about this image are: the eye-occupying cloud structures, some in shadow but dappled, the array of colors, the ripples, and the foreground of wavelets, beach, and well defined grasses. Sighhhh. I did a blog post after the Cape visit which includes other scenes on the Cape. For the rest of you old folks it also includes an audio track of Patti Page’s 1957 gold recording, “Old Cape Cod.” Sighhh. The other winners and finalists in the 2018 competition can be seen at Outdoor Photographer Magazine and I salute them all. It begins with all that’s involved. Onto the island (Long Beach) and I am slowed by the reactivated traffic lights. In all innocence I pull into the Acme to pick up some milk. The checkout line is half the width of the wide store. But folks are in a good mood and there is a guide moving us quickly to the next available register. Eventually at the house, fully de-winterized by Sigrid and Bob and freshly cleaned. I greet my beloved marshes and bay. Saturday brings some ticket punching …. bagels from the Bagel Shack, hello-ing on the deck in front of the club house, check out the logo shirts from the Ship’s Store and even buy one, and what-did-you-forget from Murphy’s Market. Saturday night is to be the annual club opening ceremony and there is anxiety about the thunderstorm forecast. The wind is whipping around and the clouds are thickening. The flag and burgees for the opening ceremony are secured, ready to go. The flag officers make a command decision: order the tent, a budget-breaker but prudent. The ONE HUNDRED AND SIXTH Season !!! Fleet Chaplain Bob Stevens gives the invocation; the bugler plays the call to colors…. Its own appointed limits keep. Commodore Van Saun makes welcome and interesting comments and the lineup of past Commodores is introduced — twenty-five present tonight representing all those years of dedication and service to the club. They stand according to year of service, the oldest in service here being Commodore John Walton who presided in 1976, forty-two years ago. The Chaplain prays a blessing for the fleet and the season … apparently a good prayer as it kept the storm at bay. The next day, a warm feeling about the evening. Good, because the day deteriorated to more of a traditional, chilly, overcast Memorial Day. By afternoon the fog had descended and the island seemed to have drifted away and the gas logs were lit. A great inaugural weekend. Now, when does summer begin? I enjoy my sun room all year long (except when I slip away to the shore for the summer). I particularly enjoy it with my first coffee and wake-up music in the morning but also frequently for lunch and sometimes even breakfast. I enjoy being closer to the world that surrounds my town house, the bird songs and the occasional passage of some of the deer that live nearby (three in the couple of days that I composed this post). A paramount feature, however, is my house plants which I enjoy all year long (yes, they go to the beach, too). With longer days the plants are responding and I’m seeing more color. Left to right I’m enjoying a hanging basket of Torenia, shelves of a Begonia and a couple of Philodendron, a spring present of Jasmine from my daughter, a Geranium and another Begonia. Then there’s the light stand with such goodies as a yellow Lantana, more Begonias and Geraniums, even a Sinningia and an Episcia and a couple of African Violets. Above them another Geranium, an aggressive Spider Plant, and a blooming Abutilon (Flowering Maple). To the right an Elephant Ears and a final Geranium. Pearl is no long around to enjoy the morning with me but the plants are a pleasure. Tours welcome. The lighted shelves and trays. There’s also a miniature rose. I’ve always enjoyed them and always watched them never bloom again. This one gave me another shot so I’m encouraged. So far it’s taken three treatments for aphids and one for black spider. It’s worth waiting a little longer. I have only two African Violets under lights; in the old days I had three 8′ x 4′ shelves under a dozen fluorescents, nurturing gloxinias, fragrant stock, marigolds, columnea, violets and begonias. A business partner once said that when he passed he’d like to be laid out in my basement. It was a delight to care for and to enjoy, particularly in a cold, dark winter but I eventually lost the war to thrips and mealy bugs. One or two are manageable, but it’s tough love, baby. One thrip and you’re outta here. Let’s go outside to close. This scene is on the wall of the garden of my long time friends, the McCallums. 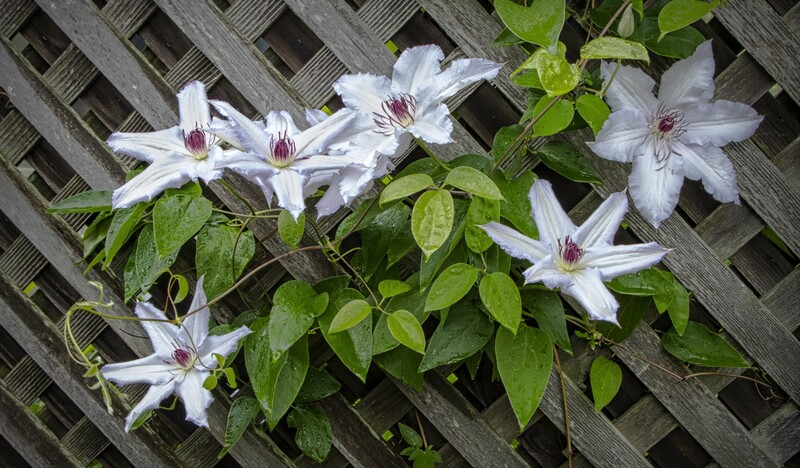 Tom had planted this Clematis a while back and it was doing well. Jeanne asked me if I could photograph it as Tom has been on our nursing floor and hasn’t been able to enjoy the season. The showery day had left raindrops on the leaves and that added to the appeal. Good Job, Tom. Click here for a full sized view. Reggie Wickham was a distinguished photographer with an international reputation. He was also a member of the South Jersey Camera Club and a contributor to our lives but we lost him in 2016. Last year and again this year the club sponsored a show of black and white images to honor his work and his memory. I submitted two images but only one got in. I dunno why but that’s the way it is in judged shows. * May 18th: This post originally said that the caller was the show chair, Pat Worley. It wasn’t; it was Beth who also as noted above then brought me a copy of the program. I apologize. I claim old age, a Manhattan down, a lot of cheering (Beth-led) over the phone, Barbara on me about taking the call, and our other friends arriving for dinner. Too much confusion and too much excitement, but thank you, Beth. Meanwhile, what did I learn from Reggie…..a principle of good composition. Here’s that back story. I was proud to know Reggie through the camera club and I enjoyed my interactions with him…except the first one. That was the lesson moment. Lesson learned. For ever ‘n ever. Thank you, Reggie. For more on Reggie Wickham see this article. As others do , I annually assemble a selection from my past year’s photography. I go through all of my files for the year, and pick out those images that I particularly liked or that I thought were noteworthy. Last year I started something new…a selection from the selection. That was an effort to single out an even smaller set that I felt best characterized my work and its breadth. That was a challenge but satisfying so here’s the story for 2017. Our lives generally restart with each new day. I had already chosen this one for the set and thought it would be good to begin the post with a new day. I am always drawn to back-lit scenes and specular reflections. That’s what I saw here but I was also taken with the father and son doing some investigating at dawn. The specular reflection also takes the eye diagonally across the image to the others walking the beach who anchor the scene in the corner . This is also a morning scene. In this case it’s early enough that the morning dew hasn’t yet evaporated. I’m fond of these beach roses and it was nice to come upon a bud just opening. I was fortunate to grab this shot while I was waiting around for a sunset scene to complete a summer day post. Instead, the drama of the cloud shapes and their side-lighting drew my interest. Then it was “Cue gull” and it flew in almost perfectly positioned. I’d have preferred it just a little more down to its right. Notice also the cloud shadow coming in from lower left to upper right. And (I’m sorry but I can’t resist it) the big cloud puff is in danger from the alligator cloud moving in on it. This is my fantasy arboretum. It consists of a pebbled glass plate on which the artist painted tree trunks and birds and then glued on bits of crackled glass along with some larger tumbled pieces. It attracted me because of its novelty and whimsy and because it’s pretty. I actually photographed two of them together, one slightly to the right and in front of the other, and then blended them in Photoshop. This gathering is a favorite for several reasons. First is the lighting coming in from our left which adds contrast to the scene, and it’s a warm morning light; second is the diagonal array of the terns and the shoreline which takes the eye well into the image to the anchoring trees at upper right; third, I like that the line of the waves parallels the beach and the birds; fourth, I always find these tern gatherings amusing. This scene is not on the beach! It’s unusual for me but it’s a special for the year. I had gone to Philadelphia to photograph a December festival of lights at Franklin Park which is located at the foot of the Ben Franklin Bridge from New Jersey. I enjoyed all of that but this scene from the park grabbed my attention. In the upper foreground is the sculpture of lightning honoring Benjamin Franklin. In the lower foreground are the headlights of cars streaming past on 6th Street in front of the steps to the sculpture. Behind the sculpture we see the traffic and towers of the bridge. It’s the kind of scene that requires study and is well out of my landscape comfort zone. Good! My friend and colleague, Richard Lewis, described the scene as asymmetric symmetry, and I like that as well as the scene. Although I admit a predilection for foggy scenes this image earned its way into the selections for total effect. The four regressively dimming poles provide the eye’s path into the image. That the poles’ direction is reversed in their reflections creates tension. Although hard to see in this image there are two Ospreys perched on the third pole; grounded due to poor visibility. This image appeals to me. It’s a statement about the darkness that says “End of season. Go home.” I like the sole foreground feature, the boat, and I see the horizon beyond the last marker as the end of the world. We’re approaching the end of the day so a sunset or twilight is appropriate. This is one of my all time favorites . The colors and clouds are, of course, wonderful. The shutter speed was slow because of the low light such that we see creamier water. But the crowning touch was to have the Willets stroll in and settle there for the 1.6″ of exposure. Without them, nice but just another twilight on the beach. Finally, and at the end of the day, we had a special full moon in early December. I set up the tripod and the long lens with extender and, yes, I got some nice shots of the moon which pretty much looked like every other moon shot in my files. Then I wondered about the possibilities of this kind of shot. It “grabs” me somehow. I know that’s not definitive but … it’s mysterious and I’m drawn into the image. I also like that next year’s buds were already formed and ready in December. Consider it an early spring image. So, there you are; a special sampling of where I was in 2017, what I saw, what appealed to me, and what I captured. Thanks for reading and looking. The rest of the year’s keepers are in this gallery. Snow in March shouldn’t be a surprise although it’s more typically in the first half. Witness the almost annual Flower Show storms. But a biggy coming the day after spring officially begins is pushing things. So…live with it and enjoy whatever part of it you can. I did. It had been hard at it all day, now rain, now sleet but finally, stormy snow. At 11:00 at night it was still at it. It demanded my camera’s attention which, unfortunately, meant I had to go out there as well. A lot of my shots didn’t measure up to what my eye saw but this one certainly made a statement. Stupid old man; out here in just a sweater. Nog! Genug! Basta! Ya está bien! Ca suffit. And that was it for the experiments. But the next morning? Ahhh, a different story. I have quoted the distinguished Bob Krist before in this blog, “If you want to take more interesting pictures go to more interesting places.” (He does, for e.g. National Geographic Traveler.) Well, it occurred to me that your own world is a greatly different place after a snow storm so get out and shoot. I looked out at it and knew I should be out there but the drifts looked a little intimidating. What the hell, my “Help, I’m in a snowdrift.” button works all over the campus so, boots on, out I went. The first steps were easy before I headed for the woods. It was a good thing that Sigrid had put up my spring wreath. Otherwise, the snow might have come right inside. But, into the woods! I had wondered how it would be on the Red Trail under a bower of snow-laden branches. It was mesmerizing, and there was a light at the end of the tunnel. Other things seen along the trail. More Ice in the Pines. Looks as though the sun will break through. Wait. It seems as though the trail is leading back home. And to breakfast. Thus endeth the snow walk. Back home again and with a golden hint of spring insisting on moving in. Hurry!